HubSpot includes standard dashboard reports for all your tools. If you are a Professional, Enterprise, or Reporting add-on user, you can create additional custom dashboards to organize your reports. You can also remove dashboards that are no longer useful for your business. Please note: Professional users can create one custom dashboard. Enterprise users can create 25 custom dashboards. Accounts with the Reporting add-on can create 200 custom dashboards. Give your new dashboard a name and set the visibility, then click Create dashboard. 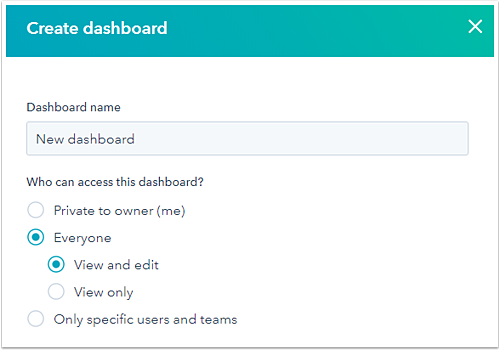 Give your new dashboard a name and set your permissions. Learn more about customizing your dashboard settings and the reports on your dashboard. Clone an existing dashboard with all its reports. Click the name of the current dashboard, then select the dashboard to clone. In the upper right, click the Actions dropdown menu and select Clone dashboard. 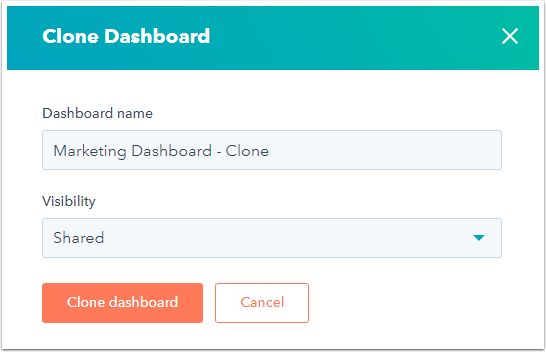 In the dialog box, enter the cloned Dashboard name and click the Visibility dropdown menu to select the users able to view the cloned dashboard. Shared: Read only: dashboard can be viewed by all users but edited by you. Shared: dashboard can be viewed and edited by all users. Private: dashboard can only be viewed and edited by you. Please note: you can only clone a dashboard if you have not hit the limit on the number of custom dashboards in your HubSpot account. Click the name of the current dashboard, then select the dashboard to delete. Please note: if you do not have the Reporting add-on, you will only see the standard HubSpot dashboards here. Click the Actions dropdown menu and select Delete dashboard. A shared/team dashboard can only be deleted by its owner. If the Delete dashboard section is grayed out and you have permission to Edit reports ownership, you can change the dashboard owner to yourself and then delete it. 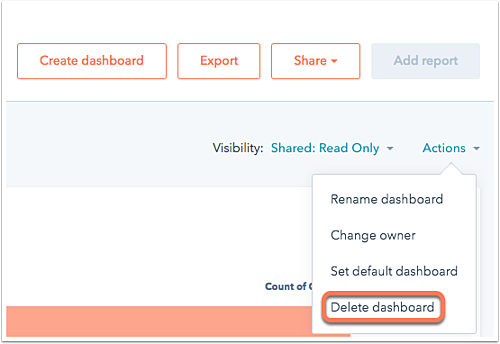 If you have the Reporting add-on, you can also delete dashboards by clicking the name of the current dashboard and clicking Manage dashboards. Select the checkbox to the left of any dashboards you want to delete , then click Delete. In the dialog box that appears, click Yes, delete dashboards.